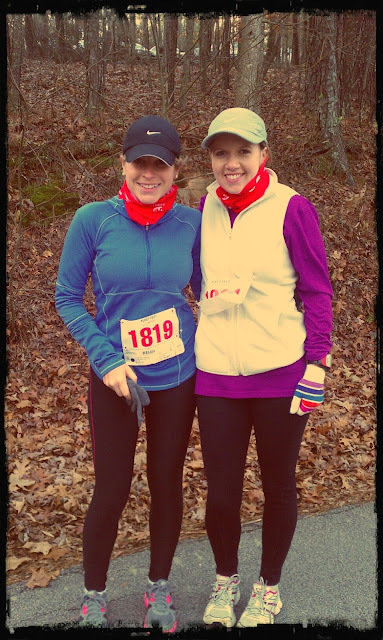 This was Holly's first half- marathon and my third. It was a trail run, meaning, we ran, hiked, and navigated small rock filled pathways. For her first half- marathon, Holly did amazingly well. She had never run more than six miles and she kept ahead of me the entire time. I was amazed. The temperature dropped as the morning progressed leaving us freezing, but it was fun and as always.. I felt amazing when we were done. Pushing myself hard through a good work out always leads to immediate satisfaction.Once I can feel my toes again, of course. No joke. Everyone should run one. Holly said she would be with me on the next goal of running a marathon(I know, how many times have I said I was going to do it??). I found this on pinterest. I love the quote and wish it were a print on Etsy. Reminds me of "try try again," but put more eloquently.